You are the th visitor on this page since 30th December 2000. 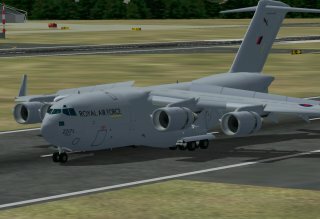 This one is a highly detailed model of a Boeing C 17. Beyond the current standards the model has a highly detailed modelling of the main gear including the complex motion of the gear during re-/extraction. 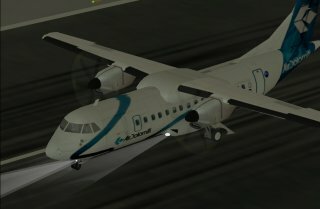 Very nice turpoprop (the same designer also developed a ATR 72, both types in different versions as -200/-500 and -300/-500) with night lighting, steerable nose wheel and visible cockpit interior. Nice model with high level of detail. 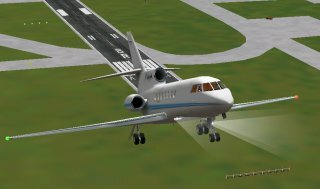 A very nice model of this little business jet. Especially remarkable is the throughout interior modelling (cockpit and passenger cabin can be seen from outside). 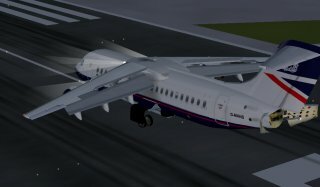 A very good model of the Bae146-200. 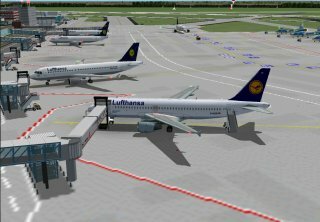 This model is one of the best freeware models currently available (and can compete with the best payware as PSS or Ariane also). 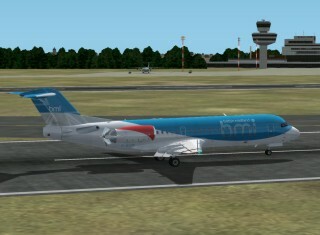 Remarkable on this gmax model are the opening cabin doors (can be separately controlled via shift+E/T/F, opening cargo door, visible thrust reverser, visible elevator trim, opening cockpit window (shift+W) and a virtual cockpit (can be used with the outstanding PSS A320 payware cockpit also). Also this model is a good one. 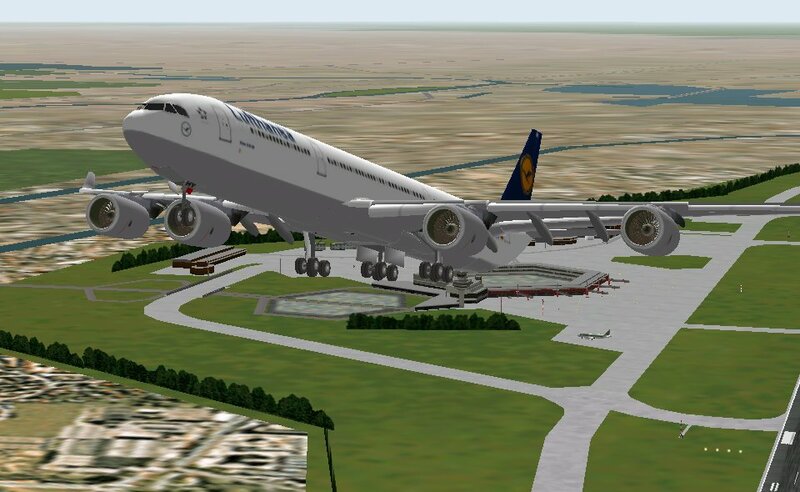 As the other models from Project Opensky this Airbus A330 is a very good model. Remarkable was the usage of FSDS as design tool. Alle parts are 3D, the nose wheel is steerable. The night lighting effects can be improved, though. I hope I can meet my own great demands with the completion of this model. 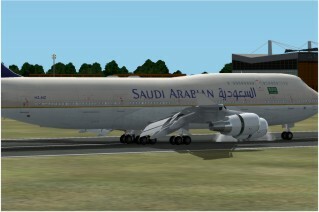 The design is 24/32 sided, the wing elements are cut from the wings (spoiler, slats, flaps, ailerons), the usual moving parts are included (also thrust reversers, see lower pciture). 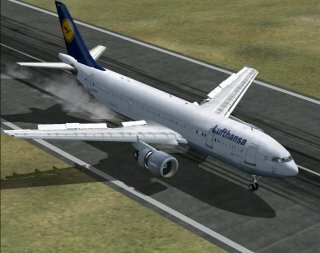 One great drawback: The aircraft is a frame rate killer (on my computer with a 1,8 GHz Athlon, 512MB RAM and GeForce 4 Ti200 it can be flown, though) . 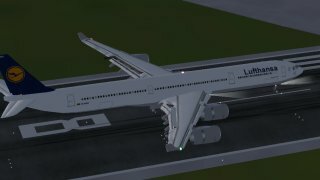 Since outstanding designer teams as Project Opensky and simubuild have the great airbus on their lists, I decided too stop this project. Furthermore a change of development environment to gmax would have been necessary to give the model the latest features. Also this model is well done. 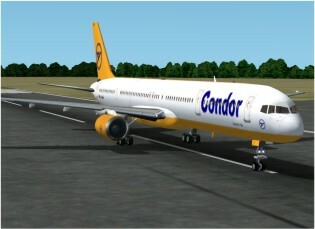 A very good model of the Boeing 737 NG-series. 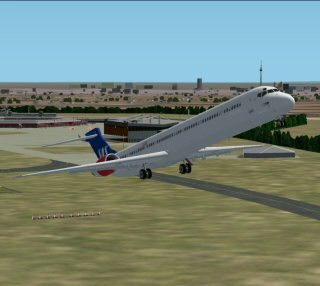 This model features the standard (as it was set in the meantime) control surface animations (with nose wheel). 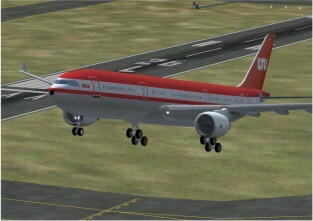 Beyond that it shows spoilerons, visible thrust reverser and rolling wheels. The other models of the NG-series (-700 and -600, the latter only on AFG, the former 'home' of Matts Falck) are also available. Nice model with tilting-bogies, rolling wheels and spoilerons. 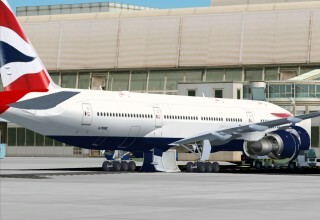 Currently IFDG is working on a new gmax Version of the 757. 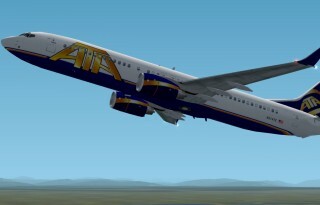 This Boeing 767-300ER was the first of a series of very good models from the Project Open Sky members. 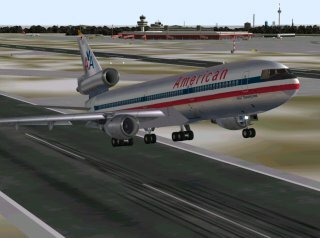 In my opinion this aircraft from FFG is one of the best freeware add-on aircraft available (it can compete with very good payware aircraft as the ones from PSS). 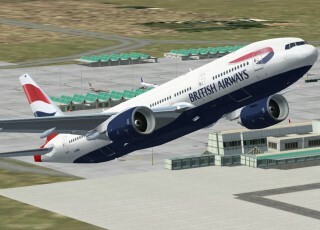 Also Melvin Rafi has released a gmax Triple Seven now. This is an outstanding model. 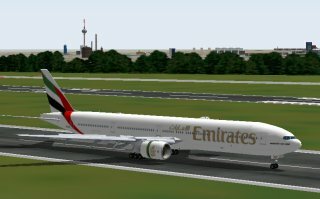 Especially remarkable is beyond the standard features of new very good models (flexing wings, visible thrust reverser, tilting bogies, steering main gear, visible elevator trim, opening cabin and cargo door) the so-called 'maintenance mode'. 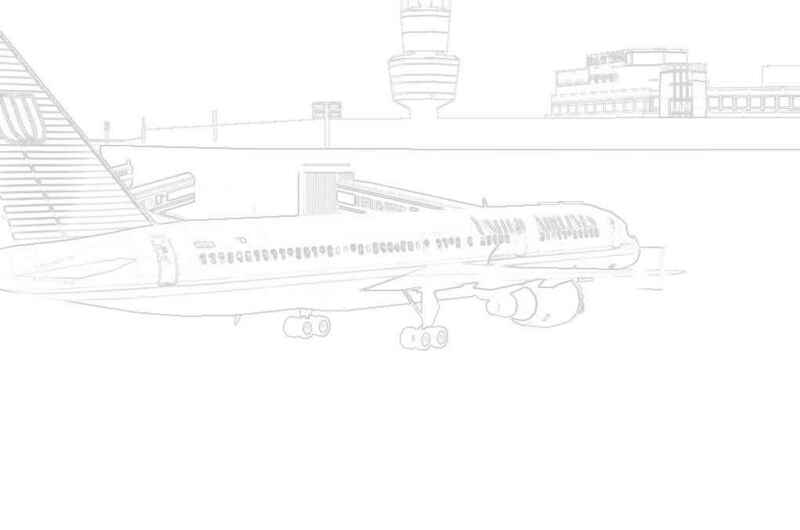 This mode (activated via shift+E) opens the engine cowlings and the gear bay doors (see the picture at the bottom). 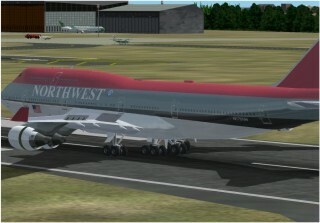 Also Melvin Rafi released a very good gmax version of his Boeing 747. 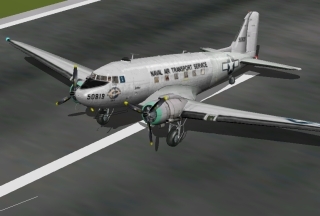 Also this model features rolling wheels, tilting bogies, compressing gear struts, steering main gear, opening cabin and cargo doors, flexing wings, visible thrust reverser and elevator trim. 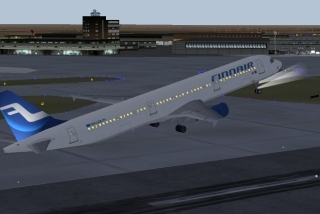 MD-90 SAS of Steve Reyling. 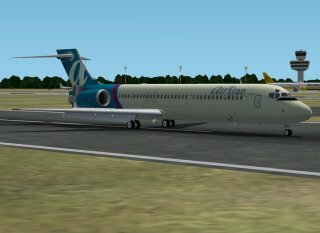 Nice model of the MD-90 with the current high feature standard (only thrust reversers not working in FS2002).